The Phizzing Tub...: What a game!! 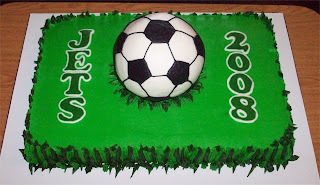 I have to say that Spencer’s team (The Jets) had one great awesome game today. The team was up 2-0 then it was 2-1 and then *gasp* 2-2. Parents were pacing the field and cheering their hearts out for their children. Time was nearing the end for the game and it was still tied. Whistle blew and then it was a ten minute overtime or until the first team scored. These players were hustling and trying their hardest to get that ball in the goal for both teams. 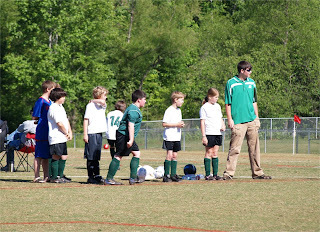 Coaches were hollering and by this point pretty much all the parents were standing and yelling. The overtime ended and now we were in a shoot out. Goal keepers were waiting and ready for the challenge. First kick to our goalie – SAVE!! I can tell you, I never cheered so much at any game as I did this one. 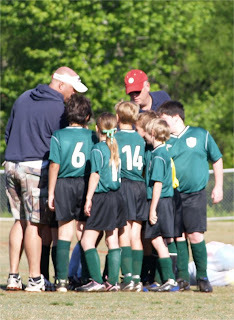 The team really started to gel over the last few games; it is too bad that the season is over. They were champions today and they themselves were quite proud of how they played. 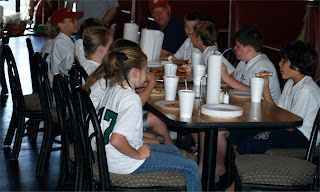 The team met up a few hours later at a local pizzeria for a party; a well deserved one at that. They had a great pizza, and one of the parents made a show stopping cake and some cookies. The kids were so relaxed and had fun. There was some talk of the children wanting to play together in the fall if it is possible. 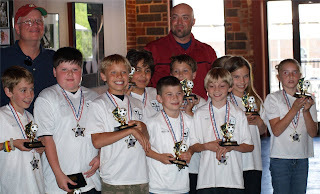 All the children were presented an award from the soccer club for playing the spring season. 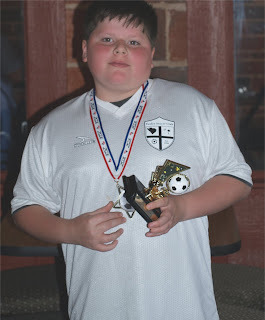 The coaches went ahead and purchased awards for each player to award them on their abilities. Spencer received the best defenseman award and true to his fashion he was embarrassed and humbled by the whole experience. What a wonderful way to end the season. 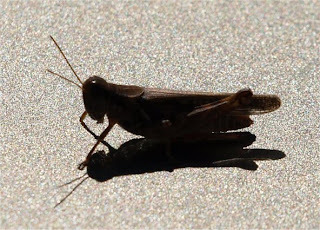 This little grasshopper Nate spotted on a car after the game.